Just a quick heads-up on a book that is coming out soon that should be a great read for any parent of a child with autism or anyone who loves someone with autism. 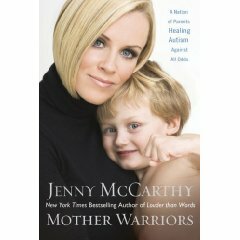 “When Jenny McCarthy published Louder Than Words, the story of her successful efforts to save her son, Evan, from autism, the response was tremendous. It hit #3 on the New York Times bestseller list; and Jenny and Evan were featured on the covers of several magazines, including People. But what she hadn’t anticipated was the overwhelming response from other parents of autistic children, who sought her out to share their stories. No two autistic children heal in exactly the same way. And in her new book, Jenny expands her message to share recovery stories from parents across the country. Mother Warriors, shows how each parent fought to find her own child’s perfect “remedy of interventions” and teaches parents how to navigate safely through the many autism therapies. I already know my wife and I will breeze through this one quickly. The line in the description that really jumps out at me is, “No two autistic children heal in exactly the same way.” Unfortunately we’re learning that’s the truth. But it does give me great hope to know that obviously people are having success and that if one treatment doesn’t work, there could be another around the corner that will help your child make great strides. When we heard Jenny speak at the Autism One Conference back in May, she mentioned this book coming out soon, but I was surprised to see it listed and coming in just a couple of weeks. I believe she also has a documentary that will be out before too long as well. You can pre-order the book at your favorite website or go pick it up when it comes out on the 23rd. I really have to hand it to Jenny for using her platform as a celebrity to really bring so much awareness about autism. It’s hard enough to find the strength from day to day to just fight your own battles, but to be able to help so many others is truly a blessing. This entry was posted on September 9, 2008 at 2:00 pm and is filed under Hope. You can follow any responses to this entry through the RSS 2.0 feed. You can leave a response, or trackback from your own site.